When I do live, oral storytelling it means that every time I retell a story it is unique. It is my interpretation and version of that story. That’s one of the most compelling aspects of the ancient tradition of oral storytelling. The stories are not read or memorised, they are ‘retold’. In the same way that my storytelling is unique, I like my illustrations and artwork to be unique. 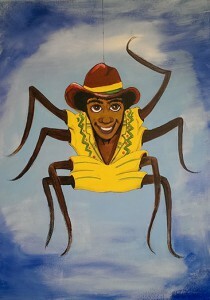 I’ve recently worked with a talented artist from Pojjart to produce artwork of Anancy the spider man. This is up my interpretation of what he looks like for my version of his tales. It was important that the artwork made Anancy look ‘friendly’ and ‘cheeky’ because although his character is flawed by greediness, he is also likeable. I’m really pleased with the end result which is this lovely painting of Anancy the spider man which I can use during a storytelling session.